Where last week’s jaunt into the culinary underbelly was nothing short of cerebral, this edition sees us travelling to, well, the underbelly. Breast of lamb, a cut near identical to pork or beef short ribs, is criminally underused and as a result is almost giveaway cheap. It has featured on these pages before (paired with lamb’s kidneys) but it really is delicious enough to stand-alone. For the gastronomically minded, it can be used to make lamb ‘bacon’ and it is a cut gaining in popularity amongst top-end chefs - Wylie Dufresne of WD-50 features breast of lamb on his menu. Whilst I’m not averse to tinkering with high end cooking: dishes that take days, rather than hours, to plate up and consist of a dizzying combination of foams, airs, purées, spheres, mousses, geleés, crisps and other such assorted tom-foolery, sometimes what you really want is hearty and basic. 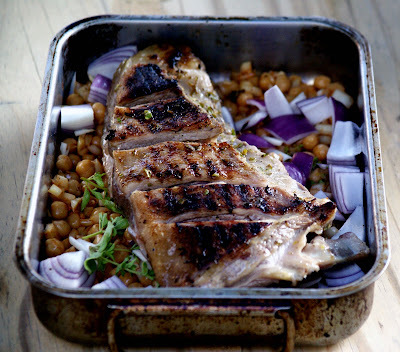 Lamb and beans is a classic combination throughout France and North Africa. Slow cooked shanks with flageolet beans. Lamb stew with white beans and fresh coriander. Rack of lamb with a bean cassoulet. Whatever the combination there is something hearty, warming and satisfying about the taste of the meat – now beginning to develop some flavour (I find spring lamb over-rated and lacking in flavour) – and the fulfilling nature of the beans. Although there isn’t an awful lot of meat on this particular cut, it is fatty and the inherent richness should leave you feeling sated without being overly full. 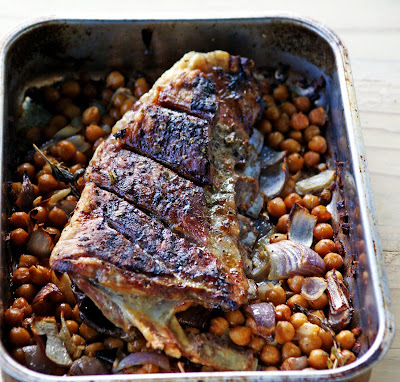 As the lamb roasts it will release its moisture into the bed of chickpeas waiting expectantly below. The result is some of the tastiest pulses you will ever chow down. A single piece of lamb breast should easily serve three-four people, depending on how long it has been since they last ate and whether or not they are the sort of friends happy to be fobbed off with extra pulses and veg instead of meat. Thought not. The recipe below is for two. Lamb breast, about 500g in weight. Zest the lemon and juice half of it into a bowl. Add the same amount of olive oil, the oregano and season with salt and pepper. Slash the top of the lamb and rub the mixture into it. Mix all the above together and tip into a roasting tray (large enough to hold the lamb). Get a ridged griddle pan screamingly hot (leave it on there for five minutes before you even think of cooking on it. Seriously. These things take an age to get hot). Sear the lamb for four-five minutes until it has some good colour on one side. Flip and cook for another couple of minutes. 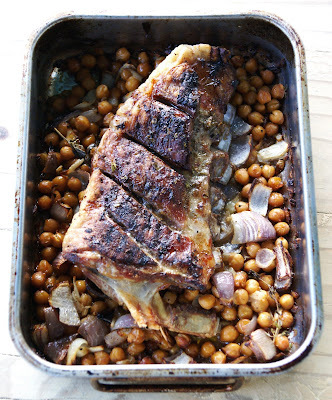 Place the lamb on top of the chickpeas and roast in a moderately hot oven (c. 150 degrees C) for about an hour and a half. Give the tray a shake a couple of times during cooking. Lift the lamb onto a cutting board and leave it to rest whilst you are plating up. Pile a heap of baby spinach leaves into the middle of a plate, top with the roasted chickpeas and hunks of meat that you have delicately carved/hacked mercilessly from the bones. Ideally, serve in front of episodes of the West Wing with a crisp white wine for company. Feel free to gnaw away at the meat still clinging to the ribs. I did. ‘You are such a shameless carnivore,’ said the GF. If I had been in a position to answer, I wouldn’t have been able to deny it. Sounds amazing. Fantasies as good as everyone says it is? I've completely fallen behind of late. Stunning, Alex. I love lamb breast. Never knew chickpeas were also called garbanzo beans. Query - what is a "pulse" in the context of your recipe intro? That looks gorgeous! I am not sure I can bear to slow cook anything indoors this week though! Larder lout - cheers, tasted pretty good too. Ollie - Thank you. It's a great cut, love it and so cheap too. Garbanzo: American translation for my chums across the pond. Foodycat - It's actually a really summery dish and only takes just over an hour. Put it in the oven, go outside and forget about it. A couple of drinks later and it's all done. Easy. oh yes, this looks just fantastic. LOVE lamb, and you are right, this is such an underused cut - and I hope it stays that way, because the price is lovely. 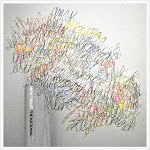 love the photos too. such earthiness to them. Great post. Glad I found it as I had a breast of lamb and didn't have the slightest idea what to do with it. I grilled mine for 4 minutes/2 minutes a side instead of searing on the stovetop. Worked like a charm. Holy tomatoes, lamb breast is FATTY. I love fat. I mean I really love it but even I was aghast at the amount of coagulated fat pooled in the bottom of the roasting pan when all was said and done. It was good, but I think we need to be deeper into the winter for another meal like that. I paired ours with wild rice, but I think quinoa would lighten it up next time. Fantastic stuff and congratulations by the way. You've inspired me to attempt to make lamb bacon. I'm going to make this tonight. Lamb breast is very cheap! Let's see how it goes. Will report back. Thank you, I really enjoyed your account. I've just purchased a breast of lamb for the heck of it. I've made "riblets" before, but never a full-on bone-in breast. When I made the riblets, I marinated them overnight in yogurt and tandoori paste and they were super yummy. Thinking of still doing that, but adding the chickpeas and then serving it with spinach and basmati rice - do you think that would work? Too heavy? nice idea,Breast of Lamb is not seen much on the menu. Thats why I get it so cheap I guess. Is 150 degrees C Moderatly hot,gas mark 2? I go a bit hotter when I do mine. Not the same recipe, that said. I have an experiment on the go as I type this. Will let you know the result. Nice Photos, will try your dish soon.